We’d love your help. Let us know what’s wrong with this preview of The Man in the Ice by Konrad Spindler. To ask other readers questions about The Man in the Ice, please sign up. You can never have to many books about bizarre scientific discoveries. In September 1991, mountaineers descending from the Finailspitze alps, in the area of Hauslabjoch, along the border of Austria and Italy, find a body half submerged in a glacier. Attempts to find the age of the corpse from artifacts found around it and the remains themselves place from the Neolithic Period, 5,000 years ago. 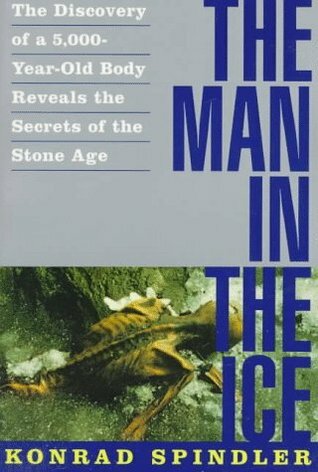 This is an absorbing account of the discovery, recovery and study of the permafrost mummy, who became known as the Iceman, Otzi. This book reviews what had been learned about the approximately 5,300-year old body found in the Italian Alps in 1991--the oldest Neolithic body recovered intact to date--by the first archaeologist on the scene. Illustrated by drawings and many fine colored plates, the text is written for the layperson. This is a compelling and detailed In 1991, tourists hiking in the Alps along the Austrian-Italian border, found a body partial visible in the melting iceberg. Over 5000 years old, these were the oldest human remains and cultural artifacts of Homo sapiens sapiens. This individual had been mummified by encapsulation in an iceberg, this ancient human came partly to the surface in September 1991. This mummified ancient human was dubbed Ötzi, a German affectionate nickname based on the Alps location. An interesting and overly factual book but worth plodding though it as l have taught about the man in ice and had the immeasurable pleasure of visiting him at the Bolzano Museum in ltaly. Since the finding of his body, he has predated the copper age by 1,000 years. His body is continually being used for medical/scientific research. Good details, but I wish I had looked for a more up to date edition (if one is available). This was written in the 90's, and I would like information on what research has accomplished since that time. That said, I'm glad I read it. I skimmed some portions, and dug into the details in others, which is about what I expected. The subject is interesting and the the original theories have not changed too much in the quarter century since this book was published. It bogged down about three fourths of the way through as it leaned heavily to the science side at that point, but I thought it ended well. Although a lot has been added to Otzi's story since the publication of this book in 1994, this is still a relevant, in-depth look at what is arguably the most significant anthropological find of the twentieth century. Spindler's style, while academic, is not overly technical. It's obvious that he was as excited to write about Otzi and all of his trappings as I was to read about him. For those interested in human prehistory and/or forensic anthropology, this is a must-read. Loved this! I like stories about pre-historic people anyway (one of my favorite series is Jean Auel's Earth's Children). I remember when they first announced the discovery of the Iceman, it almost sounded like they might be able to thaw him out and bring him back to life. Turns out that was never really an option. But the real story is almost better. Konrad Spindler tells us how the Iceman was discovered and how, along with pretty much all of his equipment he was retrieved. In this book, written Loved this! I like stories about pre-historic people anyway (one of my favorite series is Jean Auel's Earth's Children). I remember when they first announced the discovery of the Iceman, it almost sounded like they might be able to thaw him out and bring him back to life. Turns out that was never really an option. But the real story is almost better. Spindler‘s book covers the discovery, recovery and preservation of the Neolithic body of the Hauslabjoch Man. He concludes the book by exploring the Man‘s likely origins, career and final moments. Depending on your interests, you may find parts of the book heavy going: Spindler was the lead archaeologist in this matter and the more technical parts of the book are (shall we say) detail heavy. The book itself is a little dated: after it was published, investigations found an arrow head in the Man w Spindler‘s book covers the discovery, recovery and preservation of the Neolithic body of the Hauslabjoch Man. He concludes the book by exploring the Man‘s likely origins, career and final moments. I really tried to like this book. Really. The premise was exciting. A neolithic body found trapped in a glacier on the Austro-Italian boarder in the alps. The first section of the book was really dry. Do we really need to know that on the third day of the archeological dig, Spindler and his team only drank coffee, or that Splindler's wife recienved a phone call from "New Zealand", thought it was a joke and hung up? the first 3rd of the book is spent on the location and extraction of the body...i just didn't care about learning how to pronounce all those swedish locations and so it was a bit tedious for me to get through that section. once the body is in the lab and they analyze what is actually there, i couldn't put it down. with my background in horticulture i was especially intrigued that they found 17 plant materials on his person, with uses for clothing, tinder, weapon parts, etc. Fascinating to read about the Iceman from the beginnings of his discovery. Now I need to read about how these initial discoveries have been modified or better understood as time passed. Despite all the problems that came from not understanding at first what they found, I think that they did well under the circumstances. I hope it serves as a lesson to the local people that they need to be aware that these things happen and to get the experts in quickly. A bit dry to read. The book is more of a detailed report on nearly every aspect of the 5,000 year old mummy discovered in 1991 in the Austrian Alps. Still an interesting read for anyone with an interest in the world of the Neolithic (late stone age) man. This is a poorly written book about a fascinating subject. Most of the information presented is from preliminary findings that were subsequently found to be wrong. There was an interesting article in the New Yorker about the ice man's shoes. Someone reproduced the shoes he was wearing and took them for a hike in the mountains with remarkably good results. It's a bit detailed and may only interest students of anthropology, but this book provides a glimpse into the real life of anthropologists and archeologists AND what sort of world mankind inhabited 5,000 years ago. The first section of this book (about the discovery and recovery of Otzi, the Man in the Ice) was really interesting but I am having a hard time really getting into the analysis of the artefacts. Maybe a little too scientific for me. Avvincente e dettagliato, denso di informazioni. Essendo del 1998 non è aggiornato sulle recenti novità. If you're a fan of archaeology and history, this is a great book about one of the oldest Homo Sapiens found frozen solid...Great non-fiction work! Fascinating book, read it during my degree while studying the ice man, loved the book but further research now exists which makes this book slightly outdated. Very fascinating read but a little heavy on the technical details.